Beasts of No Nation opens with the story’s hero, Agu, and his gang of friends peddling the frame from an old CRT television. To fill the screenless shell, the boys enact tropish roles one would find in western television: the soap opera, kung fu, etc. “Imagination TV,” as they brand it, not only comments on the universality of play (or visually puns on the film’s standing as Netflix’s first feature film), it provides perspective, perspective on how the Western world is seen outside of our own myopia. Director Cary Joji Fukanaga, of True Detective season 1 fame, offers viewers the opposite line of sight. 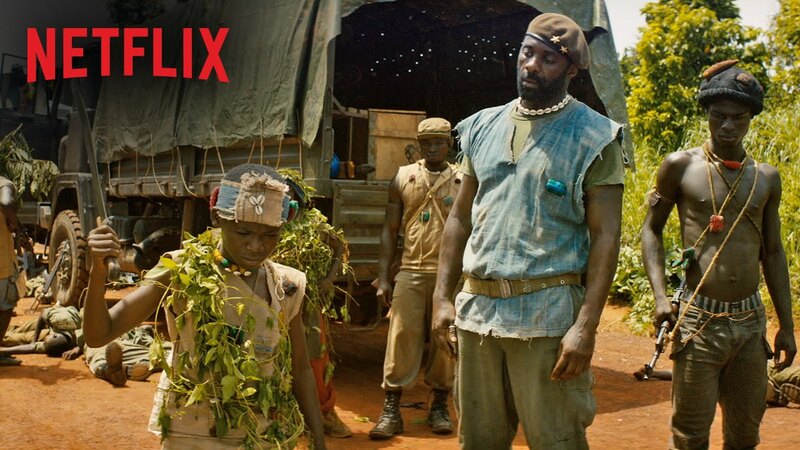 Beasts of No Nation “televises” an existence one would want to escape, a type of living that is often ignored like so many unwatched channels on your television. Cinema (since the first images were ever recorded) is fundamentally about perspective. There is no film without voyeurism. Now what matters is what we decide to place in and out of that frame. The screen can be used to escape, to forget, but for Fukanaga the frame is used to remember, to acknowledge that while we “Netflix and chill” war enacts its violence against the innocent. It should go without saying, but 20 minutes into Beasts and chill and you probably won’t be doing anything besides fighting back tears. Fukunaga has been steadily building a dark universe, albeit one that actually exists, through his feature films (sans Jane Eyre). In Sin Nombre, he offered a look into the violence and good of my home country, Honduras. Now he explores African conflict, specifically child soldiers and warlords. Forget that he’s half white for a second, and appreciate that someone with the means is telling these stories at all. Blame the game, not the player seems appropriate. Beasts of Nation is not a political film. It’s not KONY 2012. In fact, the sense here that many reactionary critics have misconstrued Fukunaga’s character study as missed opportunity for a cry-to-arms. There seems to be a lot of projection going on about what Beasts should be and little discussion on what it is. For instance how in not naming a particular country (the source book doesn’t either), Fukunaga produces a more universal and lasting artifact. The focus on the characters, the culture, the ground level conflicts revealed much more about these atrocities than calling attention to any particular real life counterpart. Political allegiance would only serve to alienate and distract with preachy abstractions. That’s not to say the film refrains from touching on the politics of the situation. The indoctrination deployed by the The Commandant (Idris Elba) is real and once you step back from its seemingly more alien aspects an uncanny resemblance to our own war narratives appear. Beyond a grab for power, Beasts presents the motivations for all wars, especially those fought by the U.S.: for country, for God, for family, for resources, for what is perceived is right. While the methods of these warlords may be more barbaric, aren’t the ends and motivations frighteningly similar? Beasts of No Nation conveys these messages with a nuance and tact that it elevates the film to stand as one of the best anti-war films I’ve ever seen. Speaking of seeing, Fukunaga does what he does best in Beasts, astound you with his cinematic flourishes in a way that adds to the story. For the unjaded by film terminology and production, the emotional effect is the only hint that Fukanaga’s camera is up to something. There are several standout pieces of cinematography throughout. One particularly harrowing (no, not the machete scene) longish take will be hard to forget. Young Agu, played incredibly by success story Abraham Attah, grounds these artistic ambitions as the hopeful heart of this tale. Our catharsis follows directly from our filmic bond with this young boy. I found myself in tears as each horror “outdid” the last, not in sadness but in anger that anyone has ever had to suffer this way. You could almost believe that this emotional core, an appeal to compassion, would penetrate even Donald Trump’s callous hairpiece. The film technically speaking exudes the inspired craft we’ve come to expect from the young writer-director. The pacing is fast. The action scenes are executed with a visceral grittiness that uses denial of information to induce fear, i.e., keeping shooters explicitly unseen or distant. Beasts can be exhausting, but is surprisingly funny and never boring. The script is tight yet produces an alluring poetry through its narration. The performances are immersive. And Fukunaga compounds these layers through confident camera movements, blocking, and composition. 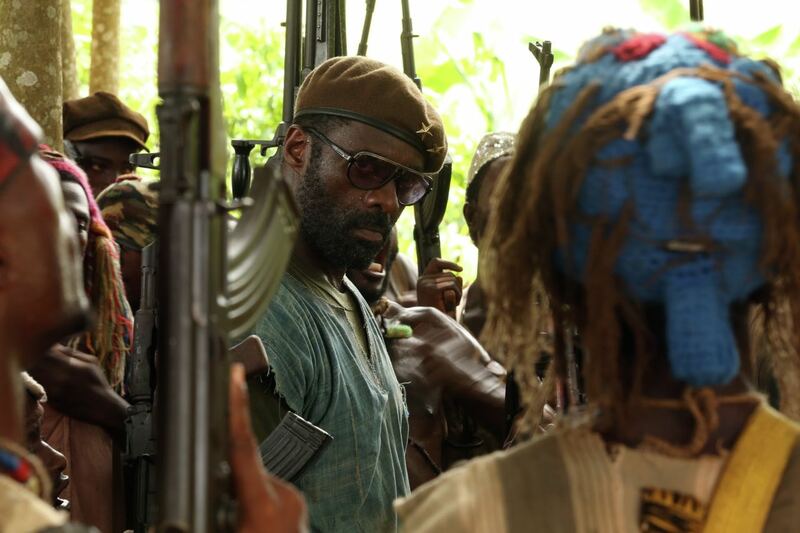 There’s no denying Beasts of No Nation’s many horrors shock, but do so with uncompromising purpose. This loyalty to the world’s realism is necessary. And the audience is better for being shaken from the stupor years of watching violent TV and film has engendered. 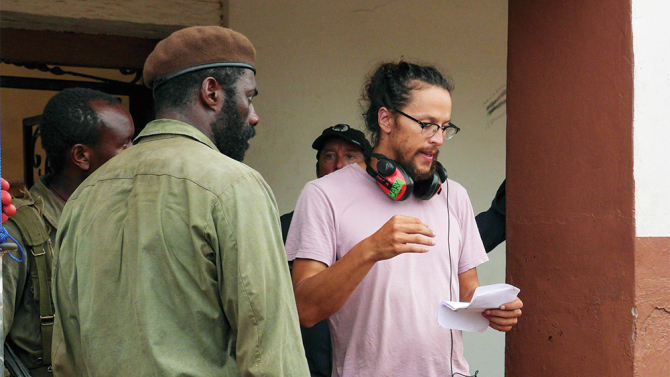 Some critics have said, “Yes, Beasts of No Nation is a well made movie, but to what end?” And to that I ask what did you feel. Did you feel disgust, awe, laughter, fear, and sadness? Beasts runs the emotional gamut to evoke understanding. The tears, grimaces, smiles, and cringes connect us to Aju, (and the boys he allegorically symbolizes) in a way that would otherwise be impossible. 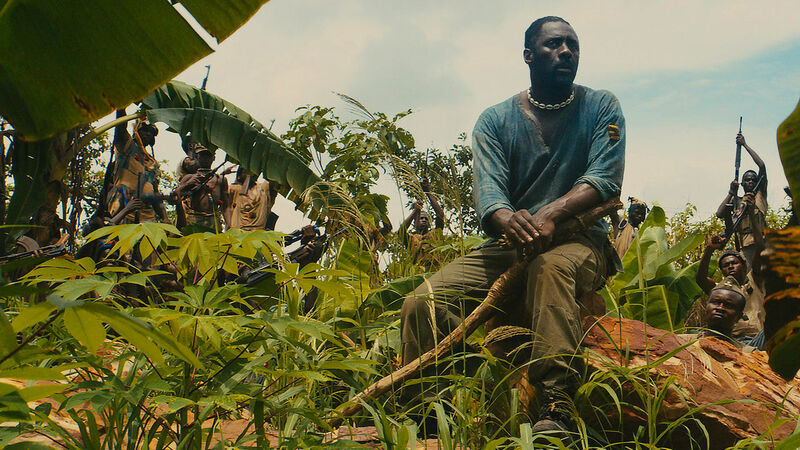 Dramatic tragedy often leads to a singular cathartic moment, Beasts of No Nation is a cathartic movement. The film’s point is maybe the most worthy goal in cinema: empathy. Will it make you go out and fight against injustice in the jungles of Ghana? Of course not. But Fukunaga (like the focus he brought to Honduras in Sin Nombre) uses the world’s most prominent form of discourse, of communication, the digital screen to show us the stories and people usually kept outside its frames.